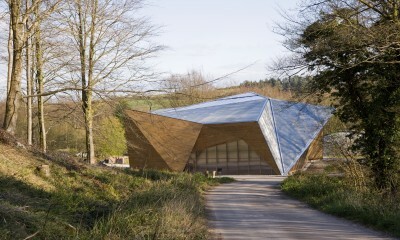 A new workshop building designed by the Architectural Association Design and Make students, on which Piers Taylor acted as executive architect, and was appointed to take on the technical design and contract administration of the project. 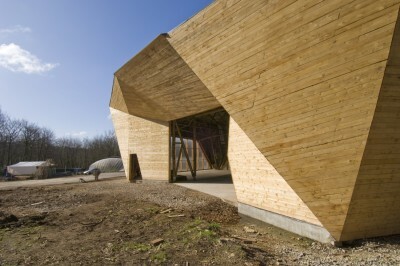 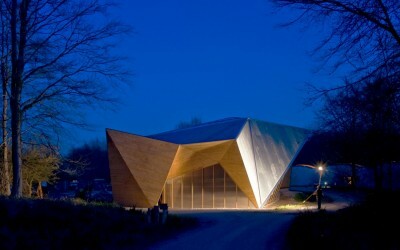 The building is constructed using prototypical techniques developed through testing in the material science laboratory at Bath University and using material extracted from the Hooke woodland, with a team put together by Charley Brentnall. 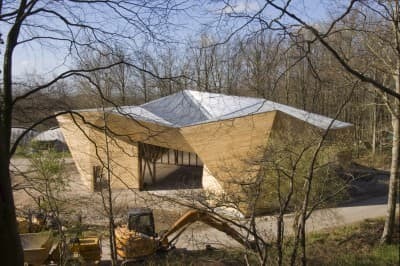 The building provides a new sheltered workspace for the Design & Make program’s build activities, and is now being used for full-scale prototyping, testing, pre-assembly and other research into architectural systems. 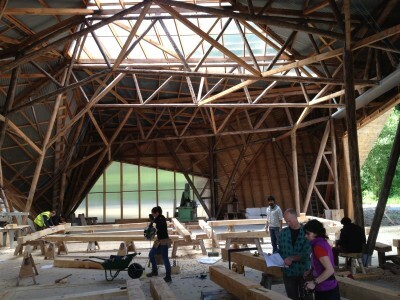 Over the coming decade, its core output will be a series of student-designed-and-built campus buildings. 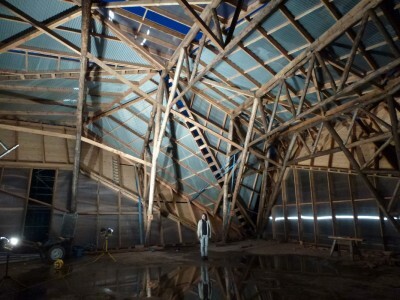 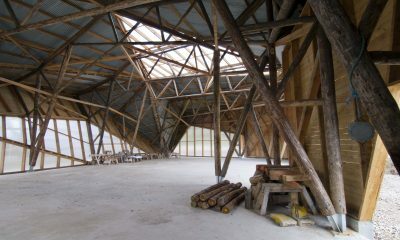 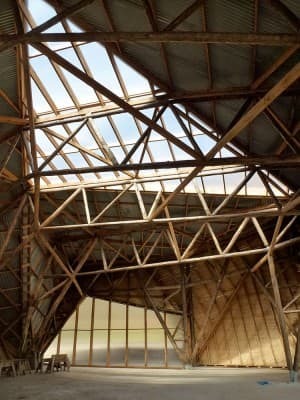 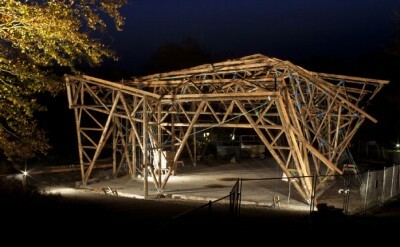 The building structure, engineered by consultants Atelier One, has pioneered the use of high-capacity screwed connections within large round-wood trusses. 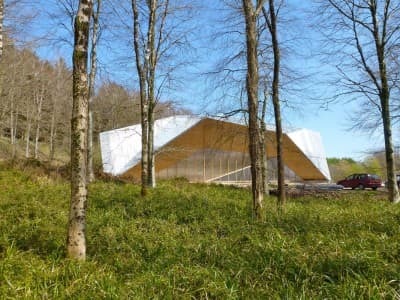 Developed through an experimental testing collaboration with Bath University, this approach allows trees to be used ‘in-the-round’ in complex structures without the need for major engineering processing. 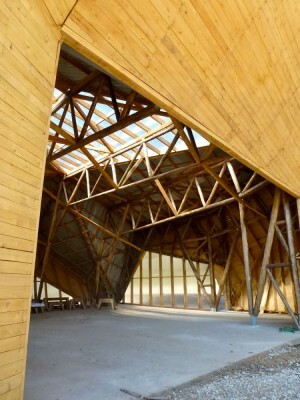 It demonstrates an approach to building that maximises the use of local resources and minimises reliance on industrial production of building components. 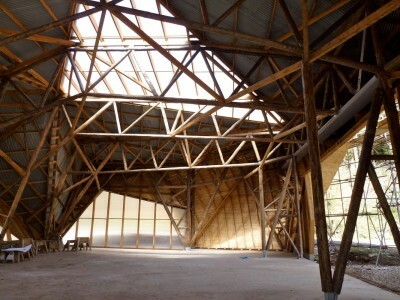 Un-regularised larch roundwood was used for the primary structure. 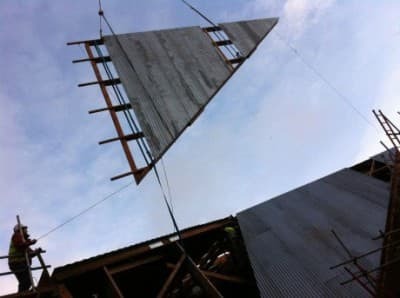 Larch was chosen for its good durability and current availability due to recent surgical felling to prevent the spread of phytophthra in South West England. 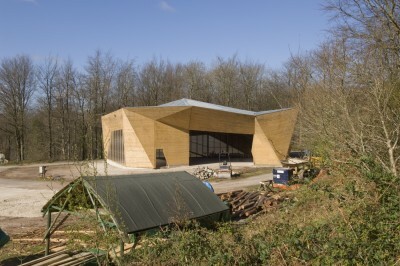 The wall panels are clad using western red cedar boarding (typically 30mm thick and 100mm wide), sawn from about 30 trees felled at Hooke Park. 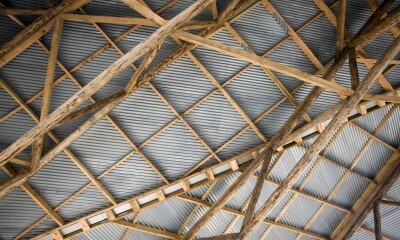 The planks are carried on triangular ‘cassettes’ with a sawn larch substructure. 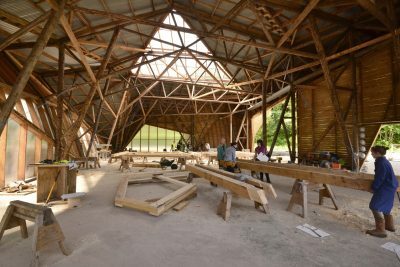 The fabrication of the trusses was carried out by a team which consisted of students both from Design & Make and summer volunteers on the AA’s ‘SummerBuild’ programme at Hooke Park, who worked alongside experienced timber framers led by Charley Brentnall. 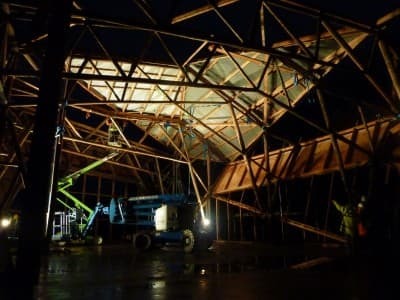 Each of the planar trusses was fabricated and assembled horizontally, before all being lifted into position on the building’s concrete slab. 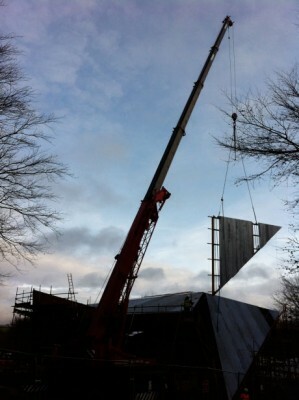 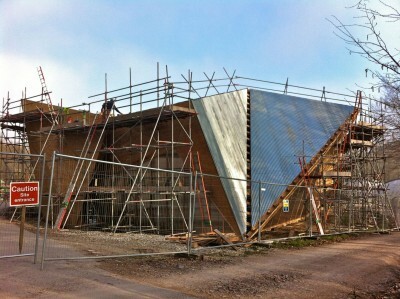 Similarly, the cladding cassettes were assembled flat and then raised into place. 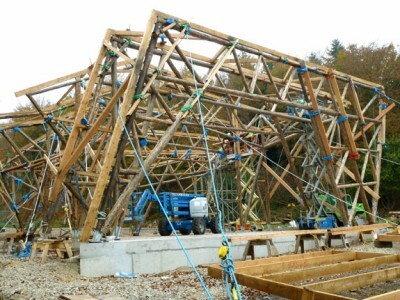 The majority of the truss connections use sets of Heco Topix screws, up to 400mm long, at cross-angles through each joint. 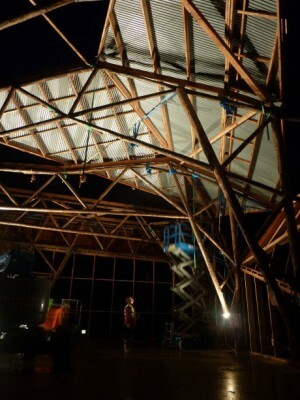 The angle of each screw had to be defined in a way that correctly related to the force direction and the timber grain (the screws need to be oblique to the radial axis of the tree to prevent splitting). 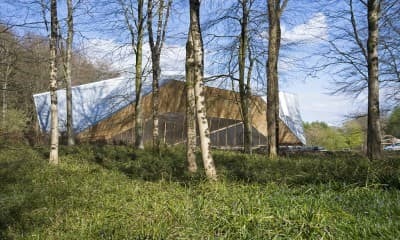 Another complexity was in how to best match the naturally varying trees trunk to the differing structural performance requirements within the structure. 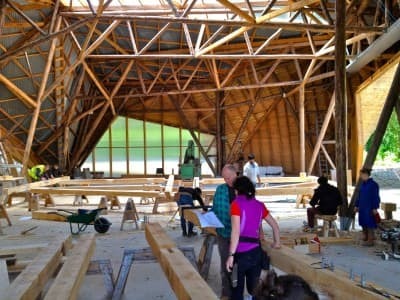 By mapping the engineer’s analysis-derived forces onto the structure, the natural variations in diameter, taper, straightness and quality (measured by the number and size of knots) were taken into account so that each tree is optimally used in the building.